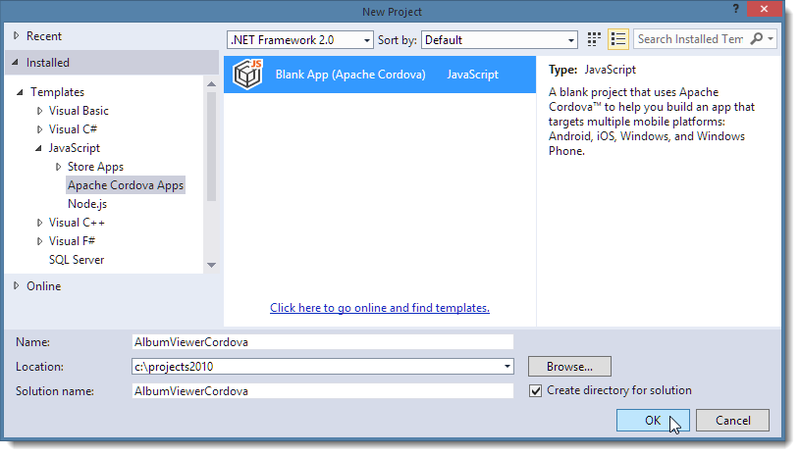 Last week I took a look at the Visual Studio Tools for Apache Cordova, which is currently available as a CTP preview. To be honest I didn’t have high hopes, given some disastrous presentations I’d recently seen on this toolset. However, I was pleasantly surprised when I actually took this toolset for a spin – it solves a real problem by providing a unified installer for the necessary SDKs and tools to support Android, Windows Phone and iOS, and provides a very well thought out development platform that builds on top of the already awesome Web tooling that Visual Studio provides. The highlight of these tools is the ability to easily debug Cordova applications using Web developer tools that are integrated directly in Visual Studio, allowing you to debug either the provided emulators and simulators, or debug actual attached live devices including iOS devices. Why do you need Visual Studio Integration? Cordova on its own does a pretty good job of letting you create projects and build them using command line tools. However, it’s your responsibility to collect all the SDKs and tools you need for each platform and set them up. On Windows you also can’t build an iOS app, which is supported only on Macs. Cordova on its own also doesn’t do anything for debugging your applications – it lets you build and run them on a device but there’s no debugging support. The Visual Studio Tools for Apache Cordova provide a consolidated installation for all the necessary SDKs and emulators, as well as an integrated development experience from coding to running and debugging of a Cordova applications, all within the boundaries of Visual Studio. Additionally Cordova natively doesn’t allow for building iOS applications on Windows, but using the Visual Studio tools you can actually develop and debug iOS apps on Windows. Ironically the iOS support currently is better than either the Windows Phone or Android experience. Windows Phone/Windows Universal debugging is not yet supported and Android debugging requires devices running Android 4.4 or later. I’ve toyed with Cordova in the past off and on, and I’ve always turned away from it because it was just too much of a pain trying to debug on device applications especially for iOS devices. Using these tools for Visual Studio however, it feels very natural to develop, test and debug your application either in a browser, an emulator or on an actual device. 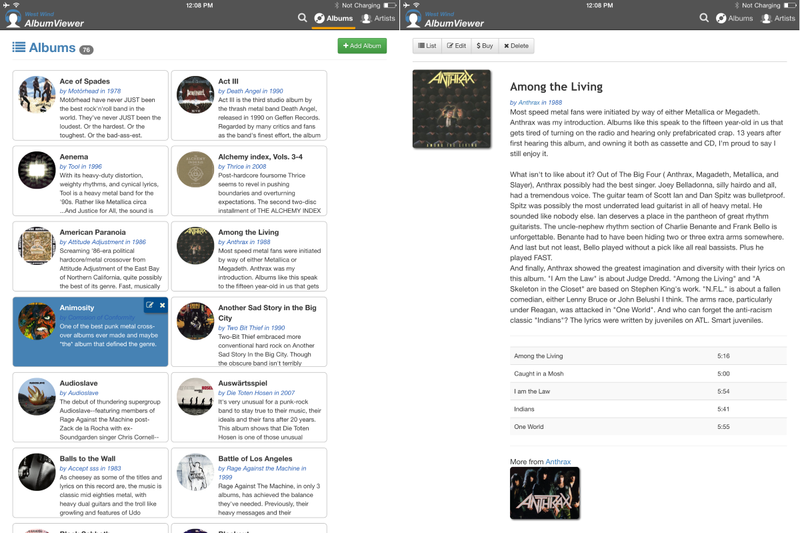 To take these tools for a spin I took a small AlbumViewer sample application and moved it to Cordova. 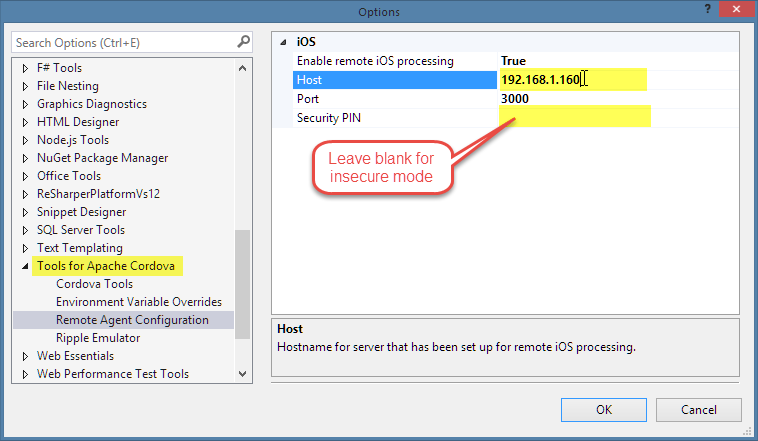 I’m going to use iOS as the example here because iOS has traditionally been the most difficult platform for Windows developers to build mobile apps for and to me this is one of the highlights of the Visual Studio Tools for Apache Cordova. Other platforms are actually easier to set up, but currently there are limitations: Android 4.4 has to be used for live device debugging, and Windows Phone/Universal currently don’t support debugging at all, but the range of support is supposed to be better by the time these tools release. Let’s get started. I’m using Visual Studio 2013 and the add-in package for the Cordova tools (CTP 3). You can also use the Visual Studio 2015 Preview which includes these tools as part of its installation although the template is available only with TypeScript there. This creates a new project that includes the various platform specific subfolders for various resources, plug-ins and merged components that Cordova internally uses to build a native application. This project contains a bunch of stuff that’s mostly related to the 3 platforms that Visual Studio defaults to: Android, iOS and Windows Phone/Universal. The key component in this project is the index.html page which is the application’s start page that Cordova launches when the mobile app starts. From there you can essentially launch your Web based application and go to town. The main difference is that the index.html references cordova.js and platformoverrides.js, which are platform specific, generated files that Cordova produces when it packages your app. Notice the three script links which load the Cordova dependencies. // TODO: Cordova has been loaded. Perform any initialization that requires Cordova here. // TODO: This application has been suspended. Save application state here. // TODO: This application has been reactivated. Restore application state here. These are useful *if* you want to take special action when these events occur, but this matters only if you are depending on Cordova specific features in your app. In the end what you are working with is just an HTML5 application, which means you should be able to use any application and just make it work. 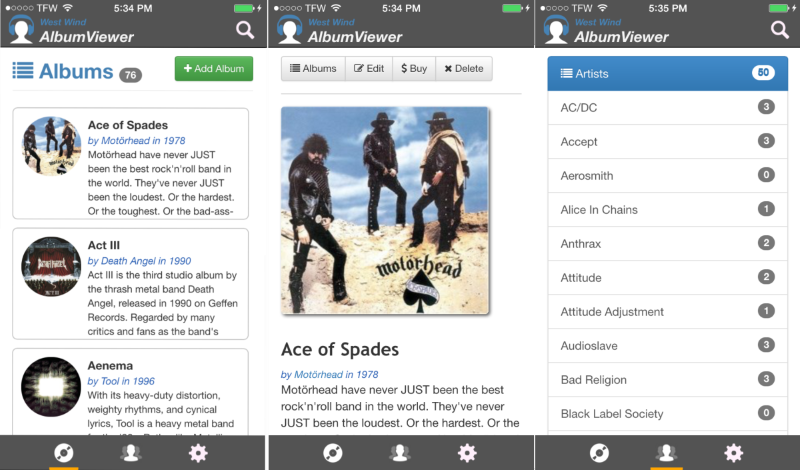 To test this theory of how well an already running mobile aware Web app would translate to run with Cordova, I took a recent sample application – an AlbumViewer I created for another article – and ported it into Cordova. I’m going to spoil the suspense by telling you up front – it worked, and it worked with only a few modifications. Here’s a screen shot of the app running on an live iPhone. So let’s take a look at the process involved in making this happen. At this point I’ve created a new project and am starting from ground zero. This existing app originally worked against a local Web service (which was the main point of the previous article), so the first thing I wanted to do is remove the dependency on the service and switch to local data. The application is an Angular application and it uses services for the data access to the service to retrieve data. Originally there was an AlbumsService and ArtistService to retrieve data. I ended up creating corresponding AlbumsServiceLocal and ArtistServiceLocal implementations that pulled the same data from local files and then stored them in local storage after that. The idea is that a mobile application should as much as possible use local data and access the Web mainly to sync. In this case I didn’t want to have the sample rely on having to set up a service locally so I kept the data all local. I made these changes BEFORE I moved the code over to Cordova, because I figured it’d be easier to do in a pure Web environment. Turns out that’s not exactly true – I can actually set up Cordova to run my app the same way, but I didn’t figure that out until later :-) I’ll come back to that later when I talk about process a little. The only file overwritten in this process is index.html which is the main startup page for my application that hosts the Angular ng-app layout and that is responsible for loading up all related script and style resources. And that’s all I changed initially. So far this isn’t impressive. All I’ve done is moved a Web project to a new folder. But now lets see how you can actually test out this application. Cordova comes with a host of different emulators and simulators. There are Web based emulators that provide basic functionality and there are the full fledged emulators that the various SDKs provide and of course you can run on an actual device. For the initial test I’m going to use the Ripple Browser emulator for iOS that allows you to see your app running using Cordova and also gives you a first taste of the debugging experience. To select an emulator select your target platform in the drop down next to the build target (Debug) list. Since I’m targeting iOS eventually I’ll use that. Then click on the drop down next to the Attach button to pick your emulator. I’ll pick the Ripple iPhone 5 emulator since that’s as close as I can get to my iPhone 6 I want to test with later. Note that there are options for Remote Device which allows me later to run on my live phone, and various Simulators which are the Mac based iOS simulators from the Apple iOS SDK. You can use either of these only if you have an attached Mac and an Apple developer account. I’ll come back to that shortly. For now I’ll use Ripple. To start up the app, click Attach… and go. When you run your application, Visual Studio launches the emulator and puts itself into Web DevTools mode. These Dev Tools look like the same Dev Tools that are in the latest versions of Internet Explorer, but note that I’m actually running the Ripple browser which actually runs in Chrome. So in effect I’m using the IE Dev Tools to debug Chrome. That’s… new and it works very well. The exciting thing here is that these Visual Studio based Dev Tools also work when you debug a native device as I’ll show in a minute. So now we can get the app to run in a browser – ho hum. We know how to do that without Cordova. So let’s take a look to run this on a live iOS device. To build apps for iOS you’ll need a Mac and an Apple Developer account. To be clear, I’m pretty green when it comes to using a Mac. Although I have a Mac Mini at home that I use for music recording and the occasional browser testing for Web applications, I generally don’t use the Mac much. When I do it feels like I’m going into a foreign country vacation… in general I’m mostly fumbling around when working on the Mac especially trying to figure out where things go when dealing with terminal related tasks. However, given the tooling and instructions Microsoft provides, the installation of the remote build agent was straight forward. Although I ran into one snag I was able to get everything running on the Mac in the course of 15 minutes which is better than I’d expected. where Username is your Mac username. The NPM installer installs HomeBrew (a package manager for the Mac if it isn’t installed already), and the XCode 6 Command Line tools as well as the actual Visual Studio Remote Tools for Cordova Build Agent. Unfortunately, for me these simple instructions did not work – I saw failures trying to install HomeBrew and I had to manually install it (http://brew.sh). Once HomeBrew was installed I re-ran the NPM install for the build agent and was able to get the remainder of the tools installed. You also need to make sure that XCode has a linked developer account which you can do by starting XCode and then going the XCode menu | Preferences | Accounts and linking a developer account. Follow the prompts to add your Apple developer account to the list of identities. This starts the build tools and listens for connections on port 3000. You specify the IP or host name for the Mac remote host, the port which defaults to 3000 and an optional security pin. I prefer to not use a pin and run the remote agent on the Mac with the –secure false flag. Unless network security is an issue for you I would recommend you don’t use a PIN as I found I had to frequently reset the PIN which turned into a real pain. If you do want to use PIN you can run vs-mda-remote generateClientCert to generate a new PIN, which is then displayed in the terminal window. When done with the config form in Visual Studio click OK. If you don’t get an error the remote agent was found and you’re ready for remote processing on the Mac. Make sure that the build agent is running on the Mac and an iOS device is attached and the screen unlocked anytime you plan on building or running your application on iOS. To run the application, open your Cordova project in Visual Studio and make sure you select iOS as the platform, and Remote Device from the Attach drop down. Then click the actual Attach button to run the app and watch the magic. When you hit the Attach button, Visual Studio communicates with the remote build agent on the Mac to push over the files to process. The remote agent basically handles setting up a Cordova project on the Mac and then uses Cordova to compile and run the project on the device (or emulator). Cordova in turn uses the XCode command line tools to build the XCode project that it creates and get it deployed on the device to test. For the first run this can take a couple of minutes as the project is set up for the first time in a temp folder on the Mac, but subsequent runs take about 15 seconds from hitting Attach to having the app active on my phone. Not bad at all. The app should now be running and behave just like a browser based app on the phone. You can see that you get both the inline inspection (notice the dummy user agent code I put in to show it’s coming from the remote iPhone), as well as the Locals and Watch Windows and the Console Window view on the right where you can use use for example console.log(albums) to log out any values that are in scope to inspect – and edit – values in real time. I don’t know about you, but I find this pretty impressive. Remotely debugging on the actual device is pretty sweet and to me at least has been one of the missing pieces in Cordova development before. Although you could always debug applications using plain browser tools or even the Ripple debugger, debugging actual behavior, styling/layout and the actual Cordova plug-ins in a live debug view is awesome. 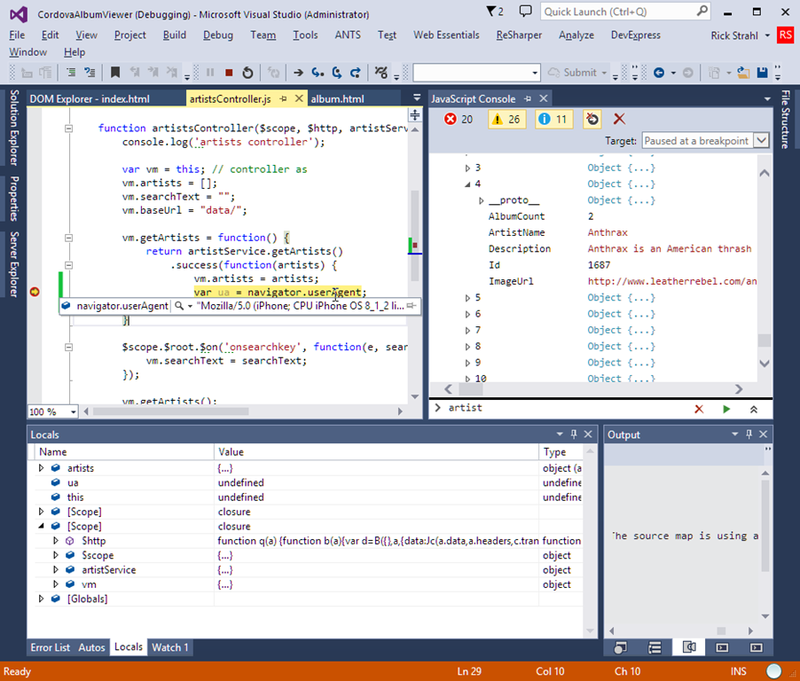 Big props to Microsoft for making this work and integrating the debugging experience so nicely into Visual Studio. Note: there’s a bit of a gotcha when it comes to debugging startup code. The Visual Studio debugger takes some time to get attached and so you can’t debug startup code and even some initial code like the first page loading. In the above example I’m stopping on event code, so that works but had I put code in the initial rendering of artists it wouldn’t have worked. If you do need to debug startup code you have let the page load and then somehow reload the index.html page after the debugger has been attached. You can add a button or link anywhere in the app (I have mine on the Settings page when I’m running in ‘developer mode’) that does: window.location.href='index.html'. This reloads the index.html page when the debugger is already attached and you can then debug any startup code. You can get this same debugging experience I just described for iOS from Android (4.4 KitKat and later) devices attached to the local machine and if the devices are switched into developer mode and have USB debugging enabled. Note that older devices are not directly supported although I think if you install the appropriate SDKs and change a few environment variables you can make it work. I didn’t try. According to the docs v4.4 and later works. I tried running my app on a v4.4 Galaxy Tab 4 7” and the app ran without much of a problem – once I had the SDKs set up properly. Once the SDK was properly installed however I was able to step right in and run and debug my application on the Android Device. Another oddity is that the Web site mentions a new, optimized Android emulator that’s supposed to install with these tools, but on my machine this emulator is nowhere to be found even though I have both Visual Studio 2015 (which also includes the Cordova tools) and the add-in package for VS2013. This seems like it would be a useful thing to have although I think having a live device ultimately is the better choice as it seems and much less resource intensive than actually loading into an emulator. In fact I picked up the Galaxy Pad for just this reason a while back. It’s not a great device (very slow and choppy especially when compared to the iPad), but it’s a good way to test on an ‘average’ Android device. Windows Phone required some special configuration to deal with IE mobile’s link fixups. Apparently Windows Phone browser considers hash-bang URLs with multiple segments suspect and marks them as unsecure:ms-appx:#/artist/2. This causes problems for Angular’s navigation and a pop up dialog that tries to download an application to handle this URL moniker. As a side note – you can also still run the app as a ‘pure’ browser app because a Cordova app is essentially a Web app plus some Cordova plug-in juju. 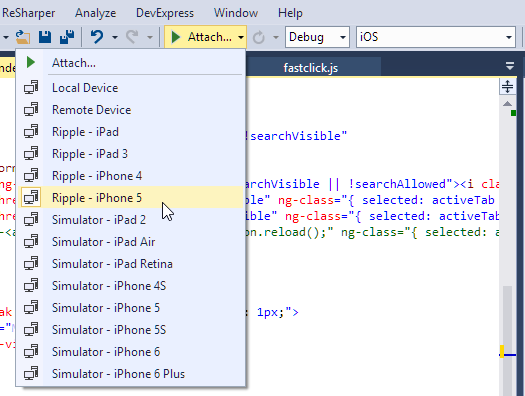 If your app can run without the Cordova specific features you can debug it in the browser. Since we’re essentially talking about Web applications here that typically have only very minor or no mobile integration that relies on plug-ins I find that I can actually be most productive developing and debugging using simply Chrome and the Chrome DevTools and then only occasionally test on the actual device. which starts the server locally on port 8080 (which you can override with a command line switch). You could also use IIS Express started from the command line if you prefer. When you run this way loading of the cordova.js file will fail (it’s not actually there) so any dependencies on plug-ins won’t work. However, anything else will work just fine inside of the browser. These Visual Studio Tools for Apache Cordova are a very nice bit of tooling that’s going to make it much easier to build mobile Web applications and get them deployed into App stores. Personally I believe that Web technology ultimately will win out over the crazy multi-platform development craze that we’re seeing now. It’s only a matter of time – but it’s just such a shame that W3C and HTML5 standards have let us down so much over the last few years to provide so little native mobile support in terms of mobile API access from Web browsers. Cordova provides a bridge by combining a plug-in API that makes it possible to build the interfaces to native devices and expose that functionality. Looking at it with a cynical eye I would say that Cordova’s approach is much more useful than the stuck-in-the-mud mobile standards for HTML5. If only the mobile browsers would provide a similar model natively we could actually expect HTML5 evolve into a better mobile platform. But alas in the meantime Cordova provides that bridge to make it at least possible to build single code base mobile applications. Microsoft’s tooling offers a very useful productivity boost on top of Cordova making the development process and more importantly the debugging process much more natural. The Visual Studio Tools for Apache Cordova are currently in CTP state with an expected release timed to the release of Visual Studio 2015 later this year. You can install these tools either as a Visual Studio add-in package for Visual Studio 2013 or by downloading the Visual Studio 2015 Preview. Go to http://tinyurl.com/ptgkz6k to download the tools and start building mobile apps. To find out a bit more about the Visual Studio Tools for Apache Cordova and this sample check out my forthcoming article in CODE Magazine that provides a bit more detail along with some additional discussion of gotchas and tweaks of the application discussed here. It’ll be in the March/April issue. Regarding the Visual Studio Emulator for Android (http://www.visualstudio.com/en-us/explore/msft-android-emulator-vs.aspx) I believe it's an additional install for both VS2013 and the 2015 preview. There are links on that page to install it. The emulator is an early release but currently supports 4.4 and runs on HyperV so it should run fast and work well on your developer machine. Email me if you run into further issues getting it to work. @Chris - I don't see a separate download link anywhere. The page says to install Visual Studio 2015 Preview which I have installed, but this emulator is not there. If you find a separate download link please post. @Mohammad - yup, planning at least a couple more in the next months. I already had the standalone android sdk installed (available here... http://developer.android.com/sdk/installing/index.html). After I installed the Cordova tools (CTP 3) and created a new project, "Android Emulator" was in my list of debug options in Visual Studio. You have to fire up the Android emulator first, then start debugging your project in visual studio. Very helpful article. Thanks from the south side (Kihei). I am starting to use MVC5 project on the back end and Ionic/Angular/Cordova on the front. I'll try to keep ya posted. I'm wondering whether this porting to phone applications could als be applied to webconnection foxpro web applications? Do you know if it's possible to have the desktop web browser as a platform in a Cordova project? Rick - how are you managing builds for multiple environments? I find myself having to change the Display Name in config.xml to get multiple application version. Such as MyApp Dev, MyApp QA, and just MyApp (production). During remote debugging an iOS cordova app, did you also notice that Visual Studio hangs when you set a breakpoint to inspect a result of a cordova plugin? A breakpoint on a line which is executed before calling a cordova plugin works without problems... Also storing the result of a cordova plugin in a variable and then inspecting it using another click event handler works. I suppose that depends on the plug-in. I use a few plug-ins for managing the UI display (statusbar for example) and haven't seen any debugging issues. But debugging or even running with plug-ins through an emulator or across a remote connection is definitely tricky. I expect that to get addressed before RTM though. By the way: What did you mean with 'RTM'? How do you set the app icon and splash screen for apple using cordova? I have updated the res/icons and res/screens folders for ios but when I upload the ipa file in itunesconnect it still shows the default cordova icon (some weird face). @quinton - there are resource folders that hold template icons. You need to replace the icons for each platform with your own artwork. It's in the res folder off the root where you can icons, screens and native folders each of which has subfolders for each of the platforms with placeholder images that you need to replace. Great article! Is the source code for the webapi available somewhere? I am interested in understanding how the json data is generated when calling the webapi in the scenario where "useLocalData" is set to false. Well, this tutorial seems nice, but unfortunatly, I have a 404 every time I try to connect the remote agent on the mac. You probably have to modify your firewall rules to allow Visual Studio to communicate with the Mac. I had success connected the visual studio corodova to mac , then run emulate iphone. But I have one question. if i had http request in my corodova project, the mac's emulate iphone always return http status is 0. I found the answer that iphone only receives https request. But i want the app can run http request. Is it possible ? @Steveen - that's not correct. You can definitely build for iOS 9 - I have several apps building with xCode 7. @joyce - The problem is iOS 9 adds restrictions for loading content from non-encrypted HTTP sources. You can work around this by using the cordova-plugin-whitelist plugin and specifying valid domains to retrieve non-https content from. 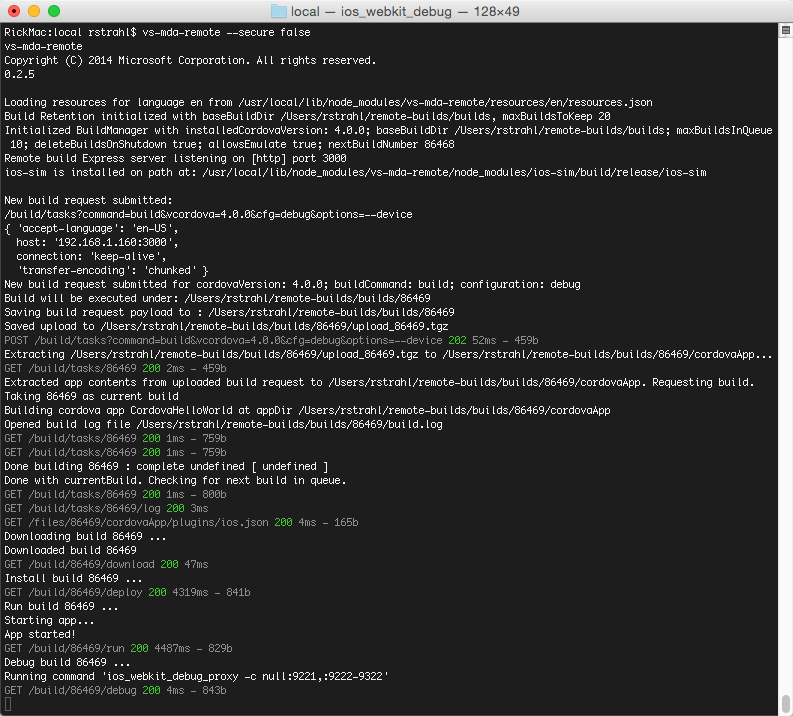 I have my xcode and mac running in vmware on my windows machine. Is it possible to build straight to the mac on vm. Tried using the IP address (IPv4 using DCHP) but wont connect. Any ideas. @Chris - yes it's possible but you probably have to muck with the firewall settings in Windows to allow the port to open. Maybe on the Mac too - I can't recall but it definitely works with the VM. Just make sure you use the right IP Address since they are different. I was wondering if you have tackled Visual Studio TACO and Typescript yet? i tried manually & same result. android BUild is OK. remoteBuild (on terminal) on iOS is ok too.